The Renaissance Sukiennice (Cloth Hall, Drapers' Hall) in Kraków, Poland, is one of the city's most recognizable icons. 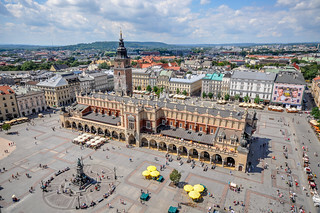 It is the central feature of the Main Market Square in the Kraków Old Town (listed as the UNESCO World Heritage Site since 1978). It was once a major centre of international trade. Traveling merchants met there to discuss business and to barter. During its golden age in the 15th century, Sukiennice was the source of a variety of exotic imports from the East – spices, silk, leather and wax – while Kraków itself exported textiles, lead, and salt from the Wieliczka Salt Mine. Kraków – Poland's royal capital – was among the most magnificent cities in Europe already from before the time of the Renaissance. However, its prosperity would not last indefinitely. The city's decline was hastened by wars and politics leading to the Partitions of Poland at the end of the 18th century. By the time of the architectural restoration proposed for Sukiennice in 1870 under Austro-Hungarian rule, much of the historic city center was decrepit. Nevertheless, a change in political fortunes for the Kingdom of Galicia and Lodomeria ushered in a local revival of sorts due to newly established Legislative Assembly or Sejm of the Land. 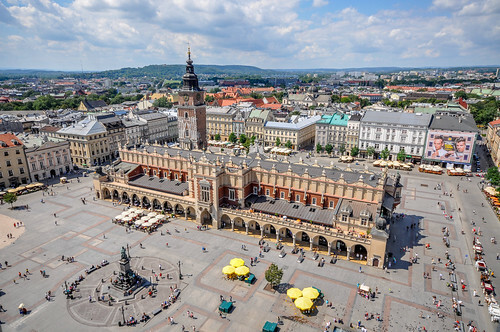 The successful renovation of the Cloth Hall, based on design by Tomasz Pryliński and supervised by Mayor Mikołaj Zyblikiewicz, Sejm Marshal in the Austrian partition, was one of the proudest achievements of this period. The Hall has hosted countless distinguished guests over the centuries and is still used to entertain monarchs and dignitaries. Britain's Prince Charles and Emperor Akihito of Japan were welcomed here in 2002. In times gone by, balls were held here, most notably after Prince Józef Poniatowski had liberated the city from the Austrian Empire in 1809. Aside from its grand history and great cultural value, the hall still flourishes as a bustling center of commerce, albeit offering items for sale that are radically different from those of previous centuries — mainly souvenirs for tourists.